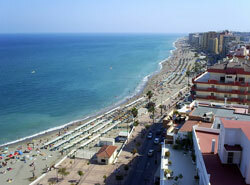 Fuengirola is situated 27 km west from Malaga and counts like Torremolinos y Benalmadena, with a large urban development. The town has an attractive marina and an active fishing port, as well as a long promenade alongside the beach, plenty of hotels and restaurants, a water park and several golf courses. The Fuengirola Zoo is different to others because of its incredible atmosphere, the absence of cages, the closeness with which you can contemplate species incredible and an exhibition not seen in other parks. At the river mouth of Fuengirola and close to the seashore lays the ancient Arabian fortress Sohail, whose medieval compounds nowadays provide shelter for music festivals and concerts.